Jeff Berlin teamed up with Markbass to create this sweet signature bass combo amp, the CMD 151P. Jeff is a master bass soloist who has been playing with some of the greats for the past 30 years, including Isaac Hayes, Bill Bruford, John Mclaughlin, and the Brecker Brothers, just to name a few. Like the other CMD amp models, the 151 combo has a built-in Little Mark II preamp to help you achieve your own signature sound. The Markbass CMD 151 also has 4-band EQ and VLE (Vintage Loudspeaker Emulator) and VPF (Variable Pre-shape Filter) filters. Unlike other bass amplifiers, the Markbass CMD 151 has no tweeter. Jeff doesn't believe in them. And if you listen to any of his performances, you'll notice there's nothing missing in his sound. 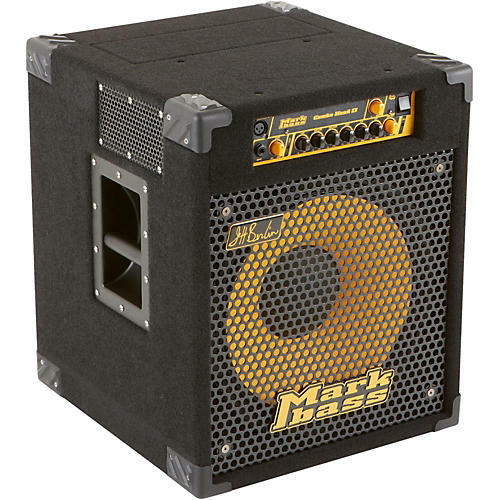 The 400W 15" Markbass custom speaker will give you all the sound you need with a tone you'll find impeccably unique and warm. Just like Jeff Berlin's playing.